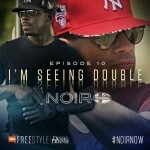 NOIR Episode 10 – I’m Seeing Double – is online and ready to watch in case you missed watching it live. Scroll down to watch this episode in its entirety or click here to view all past episodes of NOIR. In this episode, LaSorte takes his transformation into the shooter athlete a little too seriously. Okay, way too seriously. Being a shooter athlete is all about versatility, and firearms can be used in so many different ways; that’s why Colion started a freestyle course. Watch new episodes as they originally air each week on NRA Freestyle or catch up on all of the past episodes that you may have missed right here on the GunLink Blog.